Watanabe accepts some blame for Toyota's slump. TOKYO - Slumping business in Europe helped push Toyota Motor Corp. to its first operating loss in 71 years, and the company is now bracing of more red ink and massive cost cuts. 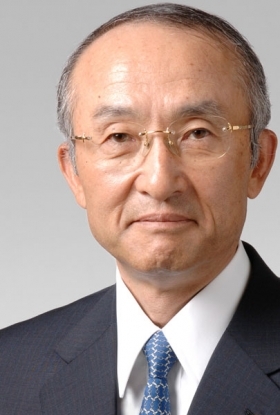 Delivering his company's financial results on Friday, President Katsuaki Watanabe said Europe swung to a 143.3 billion yen ($1.47 billion) operating loss for the fiscal year ended March 31 compared with an operating profit of $1.45 billion a year earlier. Toyota's car sales in its European markets fell by 17.3 percent to 1.062 million, as demand shriveled with the spread of the global financial crisis. Toyota sees volume dropping again to 920,000 units in the current fiscal year to March 31, 2010. Watanabe said slumping sales as a rapid appreciation of the yen against the U.S. dollar and the euro hit the company, as did a sharp rise in raw material costs. The results contributed to a total operating loss of $4.74 billion that was the Japanese automaker's first since the year ended March 1938. Toyota's operating loss was slightly worse than the $4.63 billion loss it had flagged in February and a stunning about face from the record high operating profit of $23.33 billion notched a year before. And looking ahead, Toyota doesn't expect things to improve - in Europe or elsewhere. Watanabe projected that Toyota's operating loss would widen to $8.74 billion in the current fiscal year, as the company continues to get slammed by plunging demand, soaring raw material costs and unfavorable exchange rates. The outgoing boss, who will be replaced in June by Akio Toyoda, scion of the company's founding family, acknowledged sharing some of the blame for Toyota's downfall. Toyota has already trimmed workers, idled plants, delayed factory investments and cut production to offset imploding demand. But more drastic measures are needed, Watanabe said. The new goal is to chop $8.22 billion in variable and fixed costs this year, he said. Capital expenditure, r&d spending and manufacturing expenses are on the block. Engineers will also comb over 50 models looking for the slightest of savings. Lines will be shortened to make them more flexible and responsive to changes in volume and vehicle type. Even though Toyota has bloated overcapacity -- at 10 million vehicles a year worldwide -- it is still too soon to talk about shuttering plants for good, Watanabe added. The planned cost cuts can cover the decline in sales but won't be enough to offset an expected $4.63 billion hit from the yen's climb against currencies such as the dollar and euro, Watanabe said. Such appreciation undermines the value of repatriated earnings. Toyota sees its global sales retreating to 6.5 million units, from 7.567 million in the year just ended. The figures include Toyota's mini car affiliate Daihatsu and its truck unit Hino. Toyota reached a major milestone last year by surpassing General Motors as the world's biggest automaker. But size proved little defense against hostile market forces. Global sales tumbled 15.1 percent to 7.567 million vehicles last year. Revenue plunged in tandem, dropping 21.9 percent to $211.0 billion . Meanwhile, Toyota slumped to a net loss of $4.49 billion , from a record net income of $17.66 billion a year earlier.